Basketball Blueprint provides everything you need to streamline your practices, skyrocket your team's skills, and out-play your opponents! All delivered in a simple, easy-to-use mobile interface you can take right to the gym on your iPhone or iPad! THE EASY WAY TO DEVELOP BASKETBALL SKILLS + 147+ fun, fresh and effective drills organized into easy-access categories + On-court video demonstrations, diagrams, and step by step instructions + Drills for shooting, footwork, passing, ballhandling, rebounding, team defense and individual defense + Take your team's skills to the next level! PROVEN PLAYS AND STRATEGIES + 53+ simple plays for all ages and competitive levels + Effortlessly build a playbook that emphasizes your team's strengths + Half court offenses, including Motion, 1-4, Spread, and Zone + Sideline and baseline inbounds plays + Full court pressure, press breaks, buzzer beaters, and transition offense + Score more points, shut down your opponents and win more games! LEARN FROM TITANS OF THE GAME Basketball Blueprint brings some of the most celebrated names in basketball directly to you! + Hubie Brown - 2-time NBA Coach of the Year + Bob Hurley - 27-time New Jersey State Champ + Jerry Petitgoue - 3-Time Wisconsin State Champ + Dave Bollwinkel - California College Coach of the Year + Bernie Holowicki - Five Star Basketball Hall of Fame EFFORTLESSLY DRAW PROFESSIONAL LOOKING PLAYS AND DRILLS + The cleanest and simplest way to build your own customized plays and drills + Draw, save, and share high quality diagrams, right from your iPhone or iPad, with just a few taps! + Share with your team by email, text, Facebook or Twitter + No more clunky dry-erase clipboards or binders filled with scribbled notes + Capture your team’s attention and make critical in-game adjustments DESIGN A KILLER PRACTICE IN 60 SECONDS OR LESS + Easily create custom practice plans to target your team's skill development needs + Bring your practice right to the gym on your iPhone or iPad + Eliminate your practice planning stress! No more "winging it!" 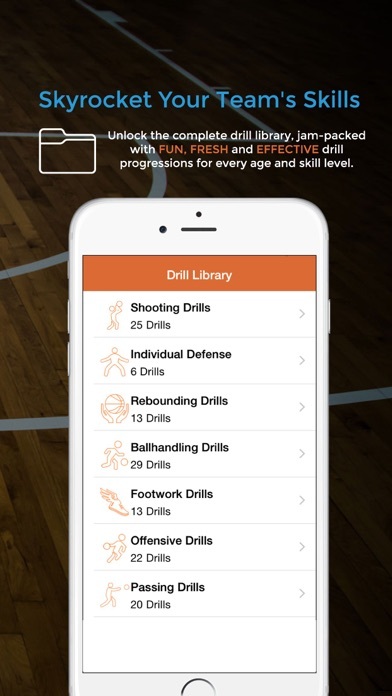 + Simply drag and drop drills from our library, or add your own custom activities + Built-in timers and reminders keep you on schedule + Includes six pre-designed practice plans for basic, intermediate, and advanced teams HERE'S WHAT COACHES ARE SAYING "Includes a variety of fresh and exiting drills for improving footwork, agility, ball handling, passing and conditioning. I have used many of the drills for my parks and recreation teams, AAU team and when I do individual player workouts." Franklin Fields Carolina Hawks Basketball Raleigh, NC "Developed ballhandling, footwork, concentration and shooting skills to help our players improve. I saw major improvement in ballhandling and court vision!" Alan Viani Our Lady of Lourdes Varsity Basketball Poughkeepsie, BY == "Coach Holowicki's post drills will give aspiring collegiate level players a wide variety of skill work to hone their go-to and counter moves." Chris Ellis Maryville University Basketball St Louis, Missouri == "I use these drills on a regular basis as Men's Varsity head coach. 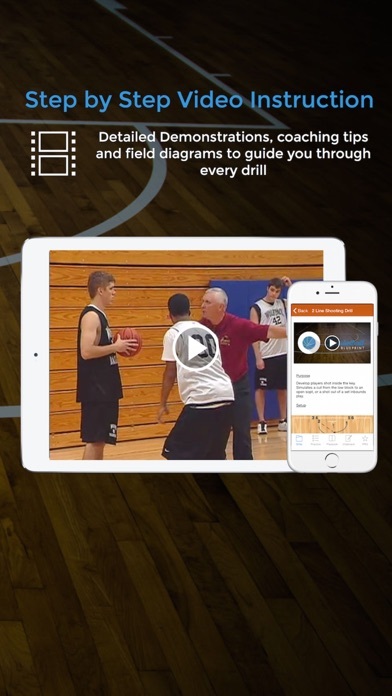 I have also used the drills with high school girls, middle school boys and elementary level boys and girls in numerous summer basketball camps. Everyone loves the drills and I have helped prepare a lot of kids for high school basketball with them." Frank Podriznik Greater Gwinnett Christian Barons Atlanta, GA == "I coached my own son and he had a habit of hitting the ball WAY too high off the backboard and missing. After spending so much time on the Dance Step drill he became the "go to" kid inside on our team!" Jeff Knollenberg Rogers Youth Basketball "Da Beasts" Albertville, MN == Download Basketball Blueprint today to simplify your coaching, eliminate wasted time, and have more fun and success on the court! This app started off great and I used it quite a bit. I upgraded to the Pro and used it often. I have been coaching a long time and this really was good for being some fresh ideas to court. Then everything disappeared . Could not get anything to load including free drills and plays . So I lost the money I payed for the Pro and cannot use it in any capacity . Such a disappointment. You’re better off using something like YouTube to get drills and plays. The best part is using the whiteboard to draw up plans right from my phone. I just tried twice to get a practice plan. It said my purchase was successful but what purchased was not unlocked. Curtis Lee- Head Basketball Coach- Paden, Oklahoma H.S. A great tool for stagnant practices! Can always find a drill or teaching tool. Also can find an inbounds play or wrinkle for your offense on game night. I highly recommend! 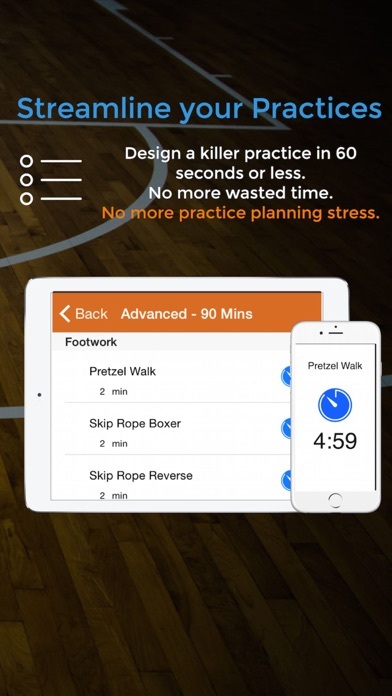 I would not recommend this app for anyone, bad video and bad drills and workouts altogether. This is by far the worst app I have gotten. Do. Not. Get. It. For. Your. Own. Sake. I had this app for a while and it worked but now it won’t show any of the drills and the sign in error shows up a lot. I don’t mind the price! If you were to buy someone’s training DVDs you might spend up to $300-500. This app is great! 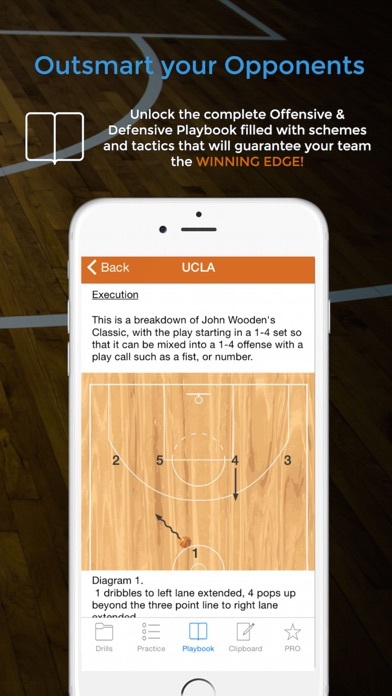 You can draw your own plays easily, it has some awesome training videos to go with it. The only reason I didn’t give it five stars is because I want the app to animate my plays so that once I’ve drawn a new play up, the players move around on the board simply by pushing play. It would save a lot of explanation. Other than that, great app, great ideas, already have seen improvements in the team from implementing two drills in our last practice. More by Knowledge Spot Inc.